The Greek government has only one sensible choice. 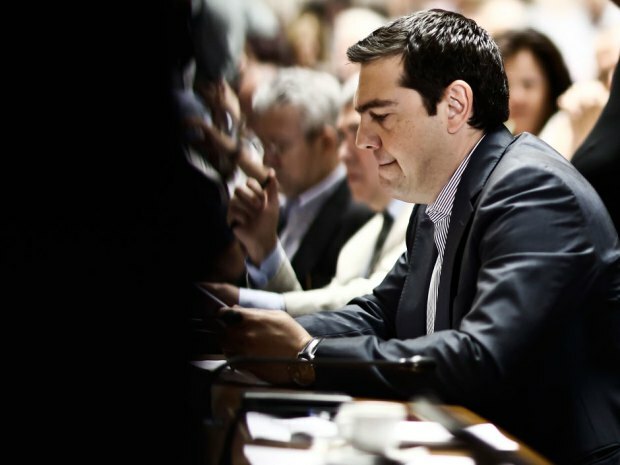 Alexis Tsipras, Greece’s prime minister, reads documents after arriving at the Greek parliament to address lawmakers in Athens, Greece, on Friday, July 10, 2015. In an 11th-hour bid to stay in the euro, the government of Tsipras offered to meet most of the demands made by creditors in exchange for a bailout of 53.5 billion euros (US$59.4 billion). Kostas Tsironis/Bloomberg. The Greek government doesn’t face hard choices in whether or not to stay in the eurozone. It has only one sensible choice — to tear up most or all of its debts and start fresh. This course, if navigated by even a half-competent government, could quickly pull Greece out of its seven-year-long depression and lead the country into prosperity. A renegotiation with the EU, in contrast, only guarantees more misery for the Greek people. Let’s first stipulate that Greek governments are 100 per cent responsible for borrowing money they knew they had no hope of repaying, and that they should be deemed fully culpable for their actions. Let’s also stipulate that the foreign banks and their EU enablers are 100 per cent responsible for making irresponsible loans that they knew couldn’t be repaid, and that they too should be deemed fully culpable for their misconduct. As for the Greeks themselves — the pensioners, the small businessmen, the workers and the youth whose unemployment rests at 50 per cent — let’s acknowledge that they have played bit parts in this drama, and mercifully sentence them to time served over the last seven years. Unlike the Greek kleptocrats and the German bankers, the common folk actually have suffered, and through precious little fault of their own. Mostly good things would follow a Greek tear-up of the loans. First, the government could no longer borrow money, sparing the citizenry a repeat of the debt debacle that has laid them so low. Next, the Greeks would adopt a new currency — likely a return to the familiar drachma, in use until 2002, which would be printed up and circulated in large numbers to create liquidity in the country. The drachma would be worth little outside Greece, making imports impossible for most, but so what? That’s a small price to pay, and a temporary one, while the country regains its footing. Greece’s largest industry — tourism — is also its biggest employer and foreign exchange earner, accounting for 10 per cent of its employment and 25 per cent of its exports. Yet Greek tourism, despite Greece’s glorious Mediterranean islands and famed attractions from antiquity, is nevertheless an underperformer, attracting just 3 per cent of the EU’s tourist business — less than countries such as Portugal; less than half as much as obtained by Turkey, its Mediterranean neighbour to the east; less than one fifth as much as obtained by Italy, its Mediterranean neighbour to the west. With tourists able to vacation luxuriously on the cheap by converting euros to drachmas, Greece would become the biggest tourist bargain going, creating a boatload of low-skilled jobs that would soak up many of Greece’s unemployed. If Greece became as popular a tourist spot as Turkey, its current 25 per cent unemployment rate could drop by about half while bringing in much needed foreign exchange. Mostly good things would follow a Greek tear-up of the loans. Greece’s second biggest industry — its merchant marine, the world’s largest — would remain a big foreign exchange earner, with a big new potential upside. By all rights Greek shipping activity should grow because of an industry that since the 1980s Greece has feared to develop — its offshore oil and gas. Greece, as a signatory to the Law of the Sea treaty some three decades ago, is entitled to claim an Exclusive Economic Zone in the Mediterranean, giving it access to energy resources worth an estimated $300-$400 billion. That bounty in the sea would have long ago been developed but for one detail — Turkey, its historic enemy, threatened war if it did so, based on claims to Greek islands and Greek waters that go back to the Ottoman period. Ironically, Greece’s membership in the EU and the easy money it provided has checked Greece’s desire to develop its energy potential, as has the suspicion that neither NATO, in which Greece and Turkey both are members, nor the EU would protect it should Turkey make good on its threat. Those checks disappear should Greece lose access to a flow of EU funds. Greece’s new best buddy would be Russia, a country with which it has an historic affinity, partly because both countries relate to the Christian Orthodox Church, partly because Russia enabled Greek freedom fighters to gain independence from their Ottoman colonizers two centuries ago. Russia today remains close, supplying Greece with its air defences and last month signing a pipeline deal to carry Russian gas to Europe through Greece, providing Greece with hundreds of millions of dollars in annual transit payments. Russia would like nothing better than to tighten its grip on Europe’s energy market, and to strengthen its military presence in the Mediterranean region through which so much Middle East energy flows, by helping Greece exploit its Mediterranean windfall. With Russia in Greek waters, Turkey would stand down. Unencumbered by unserviceable debt, and by fear of Turkey, Greece’s economy can grow impressively, as did fellow deadbeat Argentina after its 2001 $100-billion default: Argentina soon saw its economy grow at an annual average rate of 5.7 per cent, its middle class double, and its debt to GDP ratio plummet by 75 per cent. With growth, a rehabilitated Greece might even decide to send some drachmas the way of Germany’s bankers, to demonstrate its credit-worthiness and convince them to open the lending spigots again. Lawrence – I want to applaud your article. It makes a lot of sense to me.